Was resigned by the Dolphins on October 27th ... Had been placed on Reserve/Injured list on August 12 ... Was re-signed by the Dolphins on December 10, 2009 ... Was waived by the Dolphins on November 28, 2009 ... Signed by the Dolphins as a free agent on November 24, 2009 ... Released by the Ravens on September 5, 2009 ... Re-signed with the Ravens as an unrestricted free agent on 9/4/08 ... Released by the Cowboys on 9/2/08 ... Claimed off waivers and signed by Dallas on 9/2/07 ... Waived by Baltimore on 9/2/07 ... Re-signed with Baltimore on 4/9/07 ... Signed to the Ravens’ active roster on 12/5/05 ... Signed to the Bills’ practice squad on 9/5/05 ... Released by Buffalo on 9/4/05 ... Originally signed by the Bills as a rookie free agent on 4/29/05. 2010 - Played in a reserve role on Oct. 31st at Cincinnati. 2009 - Played in one game and was inactive three times with Miami ... Made his Dolphins debut in a reserve role at Jacksonville (12/13). 2008 - Saw action in nine games with the Ravens ... Finished with four tackles and one fumble recovery ... Added five special teams stops ... Also saw action in one postseason game, posting two tackles and a special teams stop. 2007 - Saw action in eight games with the Cowboys ... Had two tackles and three special teams stops ... Netted season-high two tackles and a special teams stop vs. Minnesota (10/21). 2006 - Played in all 16 regular season games with the Ravens ... Registered career highs with nine tackles, two passes defensed and 17 special teams tackles ... Added a punt return for 0 yards ... Posted career highs with three tackles and two passes defensed vs. Oakland (9/17) ... Tied for the team lead with a career-high three special teams tackles at Tennessee (11/12) ... Had a solo tackle in one playoff game for Ravens. 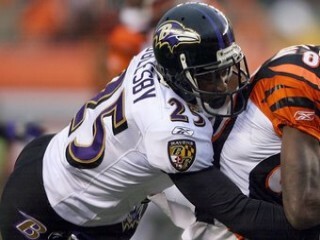 2005 - Saw action in three games as a rookie with the Ravens ... Posted two special teams tackles. Four-year starter at North Alabama (2001-04) ... Finished career with 224 tackles, 37 passes defensed, 13 interceptions, three forced fumbles, one fumble recovery and two blocked kicks ... Played in nine games as a senior ... Finished with 45 tackles, one interception, a blocked kick, and 11 passes defensed ... Had 66 tackles, seven interceptions with two returned for touchdowns, 15 passes defensed, a fumble recovert and a forced fumble as a junior ... Three of his interceptions came in the playoffs ... Played in ten games with seven starts as a sophomore ... Recorded 83 tackles and an interception ... Also carried the ball for 36 yards ... Started ten games as a freshman ... Recorded 89 tackles, two forced fumbles, four interceptions and one blocked kick. Has a son, Kyle Evan ... Attended Stephens County High School in Toccoa, Georgia where he lettered in football and basketball ... Full name is Evan Shawntell Oglesby, born December 18, 1981 in Toccoa, Ga.
View the full website biography of Evan Oglesby.